GrandPad Tablet Reviews - Ideal for Connecting for Seniors? Seniors looking for a safe, secure way to connect with their family via a digital device might appreciate the GrandPad, a senior-focused tablet from Consumer Cellular. 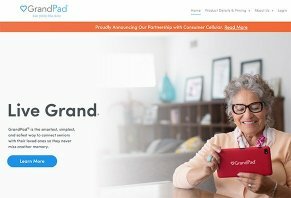 GrandPad Tablet Review: Ideal for Connecting for Seniors? GrandPad Tablet is designed for seniors that makes the digital experience easier through a set of pre-loaded photo, phone, video and email apps you use to communicate with your family and friends. The tablet is an interesting one because the user experience is specifically designed for seniors, which is something we’ll talk about in a few minutes. GrandPad is the brainchild of Consumer Cellular, a mobile phone service provider whose marketing focuses on older adults. The phones they sell are akin to the Samsungs, Apples and Motorolas you see on other sites, save for the two flip phones they provide for customers who are smartphone-averse. With a reputable company behind it and straightforward user experience, GrandPad seems like the ideal device for older folks who want to keep in touch in with their families and stay connected to the world without having to leave their home. In our review, we’ll examine how the GrandPad Tablet works, talk about how much it costs and compare it to other tablets to give you a sense of how it compares. Ultimately, we want to find out if the tablet is a smart choice whose benefits extend beyond our initial positive impression. This table ships with a case and a charging cradle, which is a nice perk for those who don’t want to have to shop for a case and charging terminal separately. The tablet has 32 GB of internal storage, a processor whose speed we could not verify and a front and back camera that are 5.0 MP each. The tablet’s screen size is 8 inches. Call: Allows you to start a video call with your contacts list. ​​​​​​Photos: This is where you’ll find photos you’ve taken with the tablet’s camera and it’s also where family members who have the GrandPad app can share photos with you. Toolbox: The feature you can tap on to have options for turning your tablet into a flashlight or a magnifying glass. Lookup: Gives you access to a dictionary and an encyclopedia. Help: If you’re stuck on a particular feature or need help, you can tap this icon and connect with a Consumer Cellular customer service rep who can provide assistance. The features pre-loaded onto the tablet are only part of the overall intention of the GrandPad. Because it’s meant to be a way for grandparents and parents to connect with family, other family members need to download the GrandPad app. This limits the usage of the tablet but it does so in an intelligent way. While the tablet’s assumed purpose is to provide seniors with an easy-to-use device, its deeper purpose is to allow you to connect with your family. As such, the tablet is designed to communicate only with GrandPad app users and the Network Administrator function allows the person in charge of the family network to limit who can call the GrandPad user. So, as you can see, this is intended to be more than just another tablet. It’s designed to provide you a safe digital space through which you can make video calls, share photos, listen to music and other functions without the worry of viruses or scam phone calls and/or emails. At the time of publishing, you could purchase the GrandPad from Consumer Cellular for $200 or opt for a fee-free payment plan that would add $10 to your monthly bill for 20 months. Best Buy is an authorized GrandPad seller who made the device available for $199.99 up-front or $33.34 a month with six months of interest-free financing. In our opinion, the Consumer Cellular offer is better because there are no fees or interest rates. If you opt for the Best Buy repayment plan, you have to pay off the tablet before the six-month deadline. If you don’t, they’ll charge you interest on the entire original purchase amount. As a side note, you can pay $5 a month and for a protection plan that has a $25 deductible. The plan covers damage from drops, spills and workmanship failures. Buying the tablet is the smallest expense between up-front and long-term costs, though. You’ll need a $40-per-month unlimited data (4G LTE) plan with Consumer Cellular to use the device. This factor is what makes the GrandPad an interesting, albeit expensive, choice. The cost of ownership the first year (up-front plus monthly) is $680 before taxes. What we like about the Consumer Cellular plan is that you have the ability to cancel your plan within the first 30 days of having your device if you aren’t satisfied. Keep in mind, though, that you have to stay under 500MB of data usage during that time. Considering the pad doesn’t have apps for watching movies or videos, we can see how it would be relatively easy to stay under that 500MB cap if you’re undecided about keeping your GrandPad. Comparing this device to tablets you can buy from your wireless provider or from pretty much any big-box store is difficult. Mainstream tablets from Apple, Amazon, Samsung and other companies don’t tailor their device’s apps to one segment of the population. Because of that, buying, say, an iPad would give you access to all the apps you want as well as video chat, photo sharing and email. And, because you can buy virtually any tablet unlocked, you can connect them to your wireless network at home without using data. The GrandPad has Wi-Fi connectivity but you’re encouraged to use data and our guess is this recommendation is based on security. If you only connect to a cell signal, you can avoid the risk of someone hacking into your Wi-Fi network and stealing your personal information. Pricewise, owning a tablet not linked to a mobile contract means you get better long-term value but higher up-front costs. For example, a 128GB iPad was $354.99 at the time of publishing, which is around $525 cheaper than the first-year ownership cost of a GrandPad. Other considerations are that the iPad has a 9.7-inch screen and an 8MP rear-facing camera. In our opinion, the GrandPad is an interesting choice for seniors who want a controlled digital environment through which they can stay connected with their family. The tablet limits the apps to what’s loaded on it when you buy it. You or the administrator of your family network can control who is and isn’t allowed to call you or email you. In that sense, this tablet gives you a secure, simple way to keep in touch with family without the worry of falling prey to hackers, scammers and online phishing scams. We also like how only those with the GrandPad app can contact you and vice versa. We didn’t note this earlier, but the app gets 4.5 stars in the iTunes store and 4.7 stars in the Google Play stores. Both of these scores are an indication that the app does well in connecting your loved ones to you. On the other hand, we believe you’re paying quite a high price for that security. The first-year cost of the tablet is $680 and $480 every subsequent year. If you purchase insurance on the tablet, the cost goes up an additional $60. If you feel the cost of the tablet is too high but are worried that using a non-Consumer Cellular tablet is too risky, take a few minutes to read our e-book about online safety. It’s a great way to learn how to keep yourself safe as you send emails, read articles and play games. We also have an excellent guide to developing your digital literacy skills. We give you five simple steps to follow to make yourself a smarter, more competent digital-device user. Write a Review for GrandPad Tablet!